Abstract: DOROTHEA is a drug discovery dataset. Chemical compounds represented by structural molecular features must be classified as active (binding to thrombin) or inactive. This is one of 5 datasets of the NIPS 2003 feature selection challenge. The dataset with which DOROTHEA was created is one of the KDD (Knowledge Discovery in Data Mining) Cup 2001. The original dataset and papers of the winners of the competition are available at: http://www.cs.wisc.edu/~dpage/kddcup2001/. DuPont Pharmaceuticals graciously provided this data set for the KDD Cup 2001 competition. All publications referring to analysis of this data set should acknowledge DuPont Pharmaceuticals Research Laboratories and KDD Cup 2001. This version of the database was prepared for the NIPS 2003 variable and feature selection benchmark by Isabelle Guyon, 955 Creston Road, Berkeley, CA 94708, USA (isabelle '@' clopinet.com). 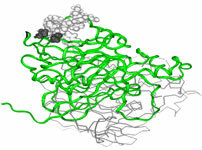 Drugs are typically small organic molecules that achieve their desired activity by binding to a target site on a receptor. The first step in the discovery of a new drug is usually to identify and isolate the receptor to which it should bind, followed by testing many small molecules for their ability to bind to the target site. This leaves researchers with the task of determining what separates the active (binding) compounds from the inactive (non-binding) ones. Such a determination can then be used in the design of new compounds that not only bind, but also have all the other properties required for a drug (solubility, oral absorption, lack of side effects, appropriate duration of action, toxicity, etc.). The original data were modified for the purpose of the feature selection challenge. In particular, we added a number of distractor feature called 'probes' having no predictive power. The order of the features and patterns were randomized. We mapped Active compounds to the target value +1 (positive examples) and Inactive compounds to the target value –1 (negative examples). dataname.feat: Identities of the features (withheld, to avoid biasing feature selection). dataname_train.data: Training set (a sparse binary matrix, patterns in lines, features in columns: the number of the non-zero features are provided). We do not provide attribute information to avoid biasing feature selection.